An exhibition of 84 poignant photographs demonstrating a new global approach to caring for people with Alzheimer's and other dementias sharply disputing the stereotype of dementia patients as "empty shells". The photo exhibit is being held at the Pace University Schimmel Center. The center is located at 3 Spruce St. between Park Row and Gold Street, just south of the Brooklyn Bridge and east of City Hall. The exhibition is free and open to the public Wednesday through Saturday, 12 to 7 pm, from March 14 through April 28. You might want to wait until April 25th. On that date, you can get to see the photo exhibit and hear me speak at a symposium about reducing the stigma of Alzheimer's and related diseases. I would likely throw in a hug if you say something along these lines, Bobby D, you da man. Better yet, lets make it simple, say, deeply forgetful. The images in Love, Loss and Laughter: Seeing Alzheimer's Differently focus on the capabilities people have left, not those they have lost. 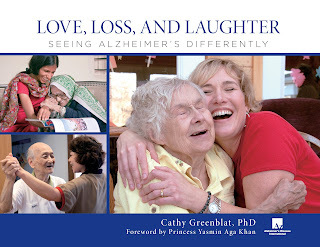 The photographer and author, Cathy Greenblat, PhD, is a sociologist who arguably is the world's leading documentarian of this new approach to Alzheimer's care. Having lost her mother and maternal grandparents to the disease, she has studied and pictured care in memory clinics, homes, day programs and residential centers in the United States, Canada, Japan, France, India, Monaco and the Dominican Republic. She will be available for interviews starting with the March 14 preview and book-launch reception at Pace (6-9 pm), and afterwards. Also available at the March 14 reception will be Marc Wortmann, Executive Director of the global organization advocating for Alzheimer's care and cures, Alzheimer's Disease International (ADI); Stephen J. Friedman, the internationally-known lawyer who is President of Pace; and people living with Alzheimer's who are willing to describe their experiences. The photographs depict people with Alzheimer's engaging with friends, loved ones, and caregivers; visiting art museums; singing and playing musical instruments; preparing meals, getting dressed for a day on the town; interacting with pets; or simply enjoying serene moments of contemplation. The exhibition's debut at Pace marks the culmination of an international tour which so far has reached audiences in locations including Washington, D.C., Glasgow, Toronto, Nice, Madrid, Salamanca, and twelve cities in India. A parallel exhibition opened at the University College London in the UK on March 7, and will then move to the World Health Organization Headquarters, The United Nations Building (Palais de Nations) in Geneva in April. 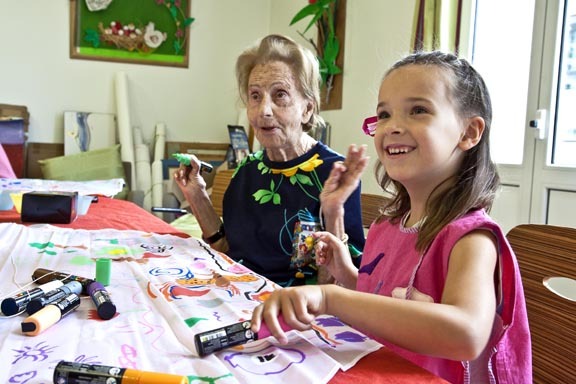 The images establish Greenblat as both an accomplished artist and a powerful advocate for an approach that improves the experience of caregivers while allowing people with Alzheimer's to sustain connections to others and their own past lives at far higher levels than is generally believed possible. The author of 14 books and more than 100 articles, Greenblat is Professor Emerita of Sociology at Rutgers University, Artist in Residence at the University Hospital Network (CHU) of Nice, France, and an Honorary Research Fellow at the International Observatory on End of Life Care at the UK's Lancaster University. The exhibition is sponsored by Alzheimer's Disease International (ADI), Pace University, and the University's College of Health Professions. You are reading original content from the Alzheimer's Reading Room. For more information on Alzheimer's and dementia go here. If you would like a free email subscription click here.